Track 2, 5, 6, 7 & 10 licensed from Raijin Records. Solstice Music in Japan surprise us this time with a new concept, bringing some of the most respected artists from the techno scene and the psytrance scene into one compilation. The cover art we get with this is also pretty refreshing and different for a change. With this compilation, Solstice Music has finally taken a new direction away from the mass produced full on they have been serving us the last few years. It is compiled by Xavier Morel, who has been playing around the world for many years, including touring with Juno Reactor. Xavier has always wanted the psytrance scene to explore a bit different sides of electronic music, which he has shown in his sets all the way, by putting more techno influenced trance in his sets. The compilation he serves us here is a refreshing add to the psytrance scene, here bringing in pretty big techno artists such as Control F, CJ Bolland, Kloq and Thomas P. Heckmann. And it definatly works for me. In my opinion, one of the most interesting trance compilations I have heard for a long time! Some of the techno stuff doesn’t get me 100%, such as the commercial sounding, almost hardhouse alike Control F track, but the usual suspects such as Eat Static, Synthetic and X-Dream doesn’t let us down… The 2006 version of the Geomancer track by Koxbox sounds a bit stripped down, but will for sure be used as a nice dj tool this year. We also get a new interesting collaboration here (Prime Suspect), which are Jan Müller (X-Dream) together with Xavier himself. Synthetic gives us something new and fresh, with a different sound than usual from him. A slow, groovy track with dark themes. My favourite track here is offcourse the Juno Reactor track Angel & Men, here in a X-Dream remix! A beautiful trance version, which I hope to hear a lot on various festivals this summer. 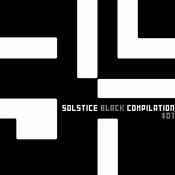 All in all, this is a really strong compilation from Solstice. I really hope this is the beginning of something more to come from Solstice. Because I really think this is something we need in todays overload of melodic full on!